Awww, no, Loki. Come back! We didn’t mean to hurt your feelings. We just wanted to make fun of you in front of your face. You are right about that, Loki really doesn’t give a fig about a lot of stuff now! He’s like forty, he’s way beyond caring what people think of him. Though he probably never cared much to begin with, hahah. It’s a good thing that he’s got such thick skin about himself. If he didn’t, he’d be a bit of a hypocrite considering how many times he managed to piss off the gods with his insults and pranks. Methinks loki just doesn’t wanna hear about the Slepnir incident. Though he loves his freakish eight-legged baby. It’s nice that the Christian girl has a balanced take on Loki. Rare to see somethin’ like that! Haha, she does! She’s Christian but she’s grown up with these same stories so she does know about him. Okay, what prank is Loki going to come up with? But then, knowing Loki, he wouldn´t really have it any other way, now would he? I mean, a trickster god isn´t a proper trickster god if he doesn´t have the reputation to match, right? Oh, you started shading the comic. I don’t want to be mean, but I prefer the unshaded style. IMO it did fit the old nordic setting better and set it apart from other comics. 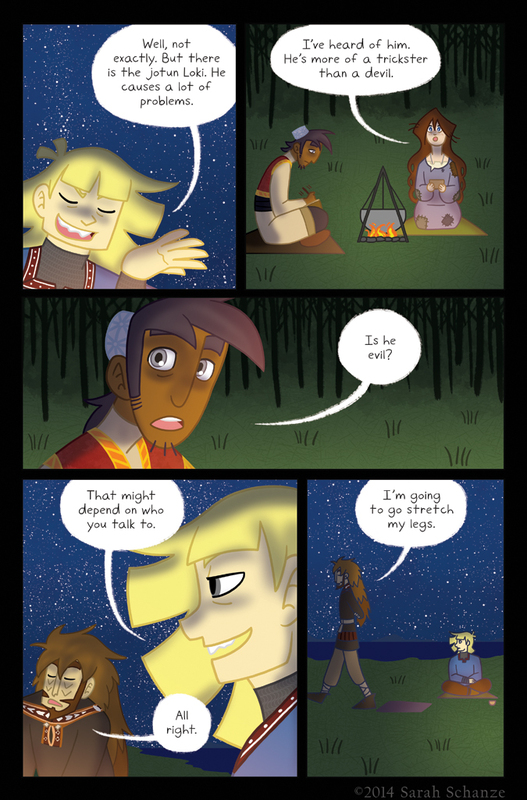 Actually, I’ve been shading the past few pages because the group’s only real source of light is the fire, and fire tends to put very sharp shadows on everything. I play around with lighting a good bit throughout the comic, and will continue to do so, but the default “style” will remain flat colors. Sometimes I like to shake things up! Coal the Troll. Sounds about right. And it even rhymes!